A pedestrian is no match for a motor vehicle, especially when that pedestrian is only a child. Too many children are injured or lost due to negligent drivers, many speeding, intoxicated or distracted while behind the wheel. These senseless accidents can alter a child and their family’s lives forever, causing physical, financial and emotional damage. Rosenfeld Injury Lawyers LLC is committed to protecting the legal rights of child-pedestrians injured in the greater Chicagoland area. Our office appreciates the concern parents have when their child is injured in an accident with a negligently operated vehicle. We invite you to contact our office for a free review of your child-pedestrian accident case. Our office is headquartered in Chicago, but we regularly represent clients from all areas of Illinois. The National Highway Traffic Safety Administration reported that in 2011, there were 516 children and teen pedestrians killed and another 22,000 injured in traffic accidents. 20% of traffic fatalities involving children between five and nine are pedestrian accidents, with pedestrian accidents being the fifth largest cause of children deaths for ages 5-19. These statistics represent lives that were scarred or taken much too young, all the more tragic since most are preventable. It is everyone’s responsibility to keep children safe, from parents and teachers to drivers on the road. The first step is teaching safe habits from a young age by educating them and leading by example. 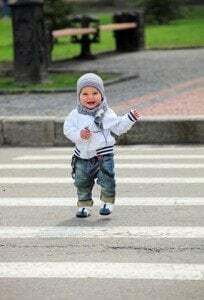 Most children are taught to look left, right, left before crossing the street and are told not to play in the street. However one of the biggest contributors to child pedestrian accidents is not kids or drivers not knowing the rules; it is not paying attention and being distracted. It is hard to keep a child or teenager’s attention focused in the best of circumstances. When they are walking while listening to their iPod, playing a hand-held game or texting on their phone, the chance that they are paying attention to the world around them is unlikely. Distracted walking has become a true danger for children, especially teens, and one that parents and teachers need to discourage and discuss with their kids. They can lead by example by not talking or texting on their own phones while walking and especially when driving. When a child is hit by a vehicle, the responsibility is almost always on the driver. Regardless of the child’s behavior, it is the adult behind the wheel that should be paying attention to their surroundings. Most child pedestrian accidents happen in areas where children are expected to be; near schools, residential areas, near parks, etc. Motorists should be on the look out for children, driving slowly and have their eyes on the road. Distracted driving is becoming one of the biggest factors in all traffic accidents and can be even more dangerous when it comes to child pedestrian accidents. Just as children need to be taught not to walk distracted, drivers should already know to keep their attention on driving. In the few seconds that it takes to read an email or text on a phone, a child may have began crossing the road half a block away. By the time a driver looks up to see them, it would be too late to stop. When a child is injured in a pedestrian accident in Chicago due to a negligent driver, Illinois law allows the parents of the injured child to recover compensation for their child’s medical expenses, pain and and long-term disability. While pedestrians in general are usually considered to have the right-of-way, many pedestrian accident cases involving children are not clear cut from a liability perspective because a child may not be crossing in a marked crosswalk or they may enter the street unexpectedly.